While there's agreement among local governments that Metro needs billions of dollars of repairs, there are sharp disagreements over who should pay for those repairs. ARLINGTON, Va. — Sharp divisions over who should pay for billions of dollars in Metro repairs are expected to delay a regional agreement among local governments that was meant to serve as a possible road map for action in Maryland and Virginia’s legislative sessions this winter. Fairfax County Board Chairman Sharon Bulova, leader of a Council of Governments Metro Strategy Group, said Wednesday that while the group has agreed that the District, Maryland and local Virginia governments should each be able to raise $400 million to $500 million in dedicated funding for Metro in their own way, she does not expect the group to reach an overall agreement this month as previously planned. 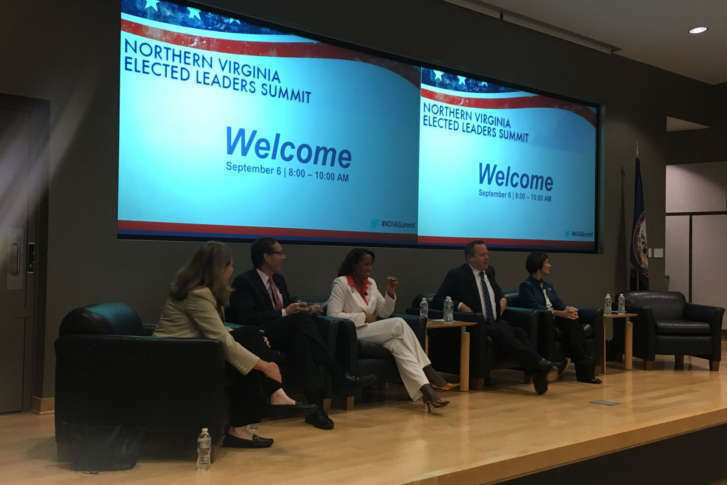 “Where we’re at an impasse is how to split the bill,” Bulova said after a summit of Northern Virginia elected leaders. The District, particularly D.C. Council Chairman Phil Mendelson, believes dividing the amount of new tax revenue needed to provide for basic Metro maintenance and repairs based on existing formulas for Metro contributions would be unfair. D.C. leaders instead support either a revised formula or a uniform regionwide one-cent sales tax increase. “I’m losing sleep trying to think what is a more fair and equitable way of doing this than using the existing formula,” Bulova said. Even if the local governments across Maryland, Virginia and D.C. agree, that would be no guarantee that the legislatures in Maryland and Virginia would approve a deal. On stage at the summit, organized by Northern Virginia’s chambers of commerce, retiring Arlington County Board Chair Jay Fisette said that dedicated funding for Metro was the single most significant issue facing the region and cannot be put off again. Fisette and Alexandria Mayor Allison Silberberg supported some type of new sales tax as an option for new Metro funding, but suggested that the rates could be set at different levels across the region. Virginia leaders oppose a regionwide flat sales tax because Virginia would collect about half of the revenue, so Maryland and D.C. registers would contribute less. “We don’t know actually who’s paying that, how many people are from outside the region, tourists paying that — how many are from Prince William or Prince George’s coming and spending money in Fairfax or Arlington or the District or otherwise. If we got a better handle on that, we might get to a more equitable solution on sales tax, but it’s not the only option either,” Fisette said. Silberberg believes the funding can actually get done. Fisette emphasized that the biggest issue that needs to be addressed now is dedicated funding to allow Metro to be rebuilt, even though the only potential agreement among Maryland Gov. Larry Hogan, Virginia Gov. Terry McAuliffe and D.C. Mayor Muriel Bowser appeared to be shrinking the size of the Metro Board. “It really doesn’t depend as much on whether the person’s appointed by the state or whether it’s six people or eight or 12 — it’s who the people are,” Fisette said. Loudoun County will join the Metro Compact and begin paying a share of the system’s costs when the Silver Line’s second phase opens in a few years. Loudoun County Board Chairman Phyllis Randall pushed the federal government to contribute more. “You stop Metro, the federal government stops working. The federal government stops working — as well as it works — the country stops working,” Randall said.